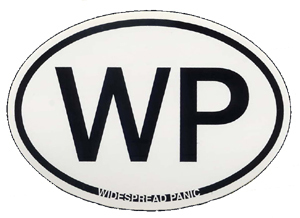 This Widespread Panic sticker is based on the European oval country stickers. It measures approximately 3 1/2" x 5" and is official Widespread Panic merchandise. Thanks for the sticker. I have ordered from yall in the past and always will. Product comes fast and always in excellent condition. Customer service gets 5 of 5 rating! Thanks again!